Hmmm, interesting. And funny considering how i can’t help but feel like SMBCO is not wide enough, looks very squished into my monitor.. large LARGE black areas on both sides. 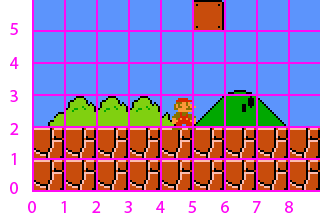 But i realize also that it’s based on old NES ratios. If you separate rendering from game logic, you have all the control you need. I’m enjoying the frequent posts. Keep it up! I couldn’t even imagine measuring in pixels, that makes the graphic you showed in your vid recently make total sense. Thx for the great post! All the stuff I did before measured stuff by pixels. I should probably start using units. Good point. Do you always use the delta time of framerates in your movement speed calculations to ensure frame rate independent movement? Yes, but I will most likely switch to a fixed time step at some point. A problem I tend to encounter when using delta time is what if there is a low enough framerate that momentarily causes the movement to “jump” a larger than normal distance so then my collision detection may pass through an object? Any suggestion? Have a max delta. That’s what I did in SMBC.